June 5, 2014, 12:51 p.m.
Do you need your face unmelted today? Then don't click on this by @jashkenas & @aliciaparlap: http://t.co/wKSbmr9xpF You've been warned. 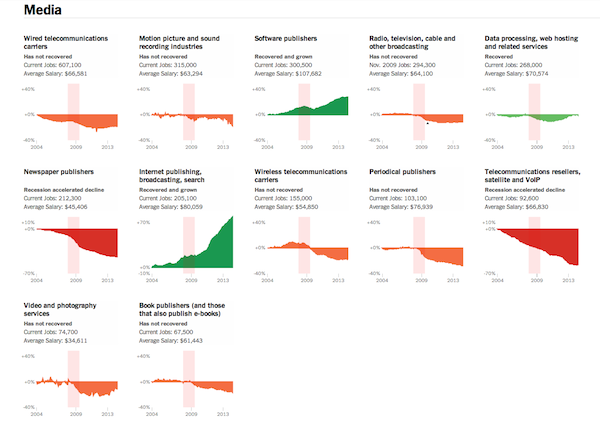 Interestingly, their findings suggest that, in addition to all print-related industries, radio, TV, and broadcast have also failed to recover from the losses of the recession thus far. O'Donovan, Caroline. "Here’s how the recession affected jobs in newsrooms, publishing, advertising, and more." Nieman Journalism Lab. Nieman Foundation for Journalism at Harvard, 5 Jun. 2014. Web. 19 Apr. 2019. O'Donovan, Caroline. 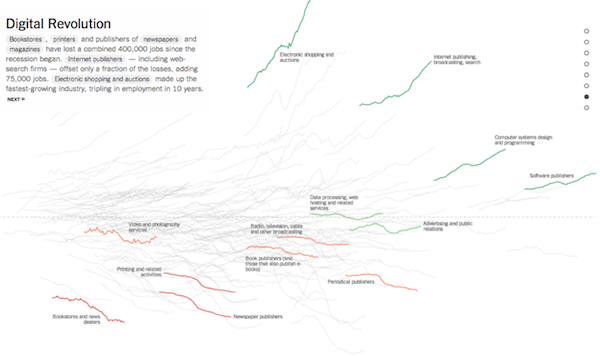 "Here’s how the recession affected jobs in newsrooms, publishing, advertising, and more." Nieman Journalism Lab. Last modified June 5, 2014. Accessed April 19, 2019. https://www.niemanlab.org/2014/06/heres-how-the-recession-affected-jobs-in-newsrooms-publishing-advertising-and-more/.